In Muzaffarpur, Bihar hospital did not provide ambulance after a patient was referred to another hospital. Youth’s leg was broken and plastered. But in this pitiable condition, the injured youth crawled his way to another hospital for treatment. Sanjay Kumar was admitted to Sadar Hospital in Muzaffarpur two days ago. He had broken his leg when fell from running train. Doctors referred him to better treatment to another hospital and promised to provide stretcher or ambulance. Later, doctors refused to provide ambulance saying it there is no petrol in its tank for last three days. 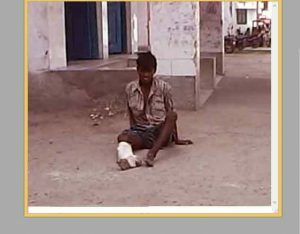 Under these circumstances, Sanjay had to crawl on the road to reach another hospital. Sanjay has not disclosed information about his family and address so far. Meanwhile, hospital management has refused any comment on the incident.